How do I use stickers? How many stickers can I give a sim? Will they know it was me who sent it? I’ve run out of stickers what do I do? Why should I use the stickers? 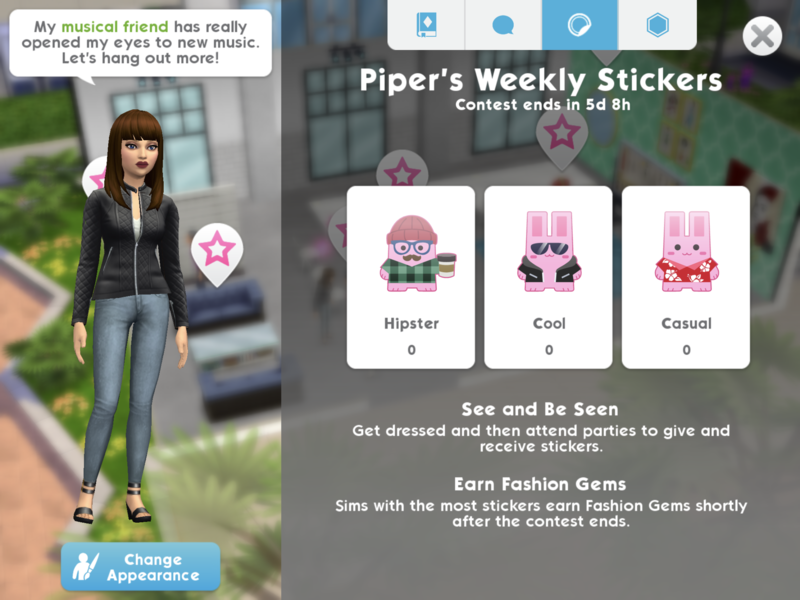 One of your daily tasks on your to do list is to give stickers, completing this will earn you 2 fashion gems which you can spend at Izzy’s Fashion Shop on unique outfits! hey what does the blue plumbob mean? These are other players sims. What do you do when it tells you there is no sticker contest but you need to give stickers to finish your daily rewards? There is always a weekly sticker contest, the other week I didn’t get my reward for receiving stickers once the week was up so this may have been part of the same glitch which hopefully was fixed in the small update they released yesterday. I am having a problem with my stickers and daily To Do list. It says I need to give out more stickers – it is showing 2/3 given out. But I am giving them out like crazy! And to new people! (I understand you have to give them to different people.) Looks like I am not going to finish my To Do list today! I also wanted to know if the male/female clothing generated in Izzy’s Fashion Shop is totally random and choosing is out of our hands. Is it? Because I have got 5 male clothing in a row! None female clothing so far! And I am a little frustrated. Thank you for taking the time to make posts about the game. Yes it is random! Do you have a female sim yet? If not you may not get any female outfits until you do but apart from that it is out of our hands! You’re very welcome, I hope that post helps! Hi! Thank you for this page and your hard work💕🙇 could you make a post about Izzy’s Fashion Shop? I don’t really get it. Also, do you know how many sims you can have max? I have two atm. Thanks! You can have 4 playable sims in total. How many stickers do you need to get to earn fashion gems? Can I see what stickers people gave me? When you log in each day you will see the stickers you got the previous day but you won’t see who gave you the stickers. How can you track how many stickers you have so far? And when does the week end to get the fashion gems? What if the sim retires? Will I still be able to recieve the weekly fashion gem reward? If it doesn’t go away you may need to contact the makers and see if they can fix this for you. How do I get the most stickers from other players? I’ve been giving aaay all my stickers and getting NONE back. Is there an area where I am more likely to receive stickers from other players? Ps. Love your blog, always so informative! Hi I just finished my first sticker contest and received 22. However, the contest ended and I didn’t receive any gems / there was no notification to claim gems. Would you possibly know what that means?